The Database Previewer (shown above) lets you see your Scenario tree structure and download scenarios as required. The Scenario Manager lets you view and manage the properties of the scenarios, which may be needed as your model grows in size and complexity. You can have as many scenarios as you want. 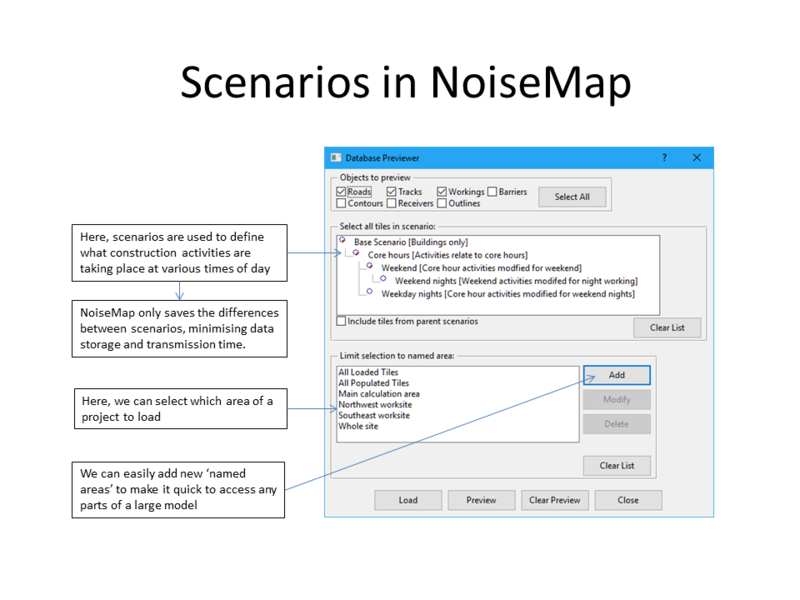 NoiseMap only stores the differences between a new (child) scenario and the previous (parent) scenario. The rest of the model is inherited from the parent. The Database Previewer also makes it simple to download just a part of the model: you can easily give a meaningful name to any part of the model and then you can download any one of these areas. * For construction sites, you may also want to assess the noise levels in each week or month of the project, again for different times of day. 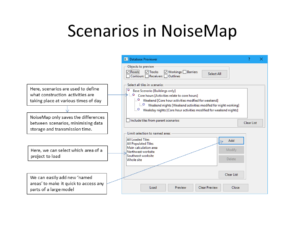 NoiseMap has a further tool, known as Categories and Combinations, for dealing with this.